In the last trecena Deer/MANIK offered all the Spiritual Tools we need, and promised to bring a new tool anytime we encounter our own limitations. From a Dream and Longing for Light and Happiness, a Dream shared by the Creator, AHAU walks with us every day to help us hold the Vision of the Light we Dream to reflect. AHAU is the Omega, the ALL in One… the Whole of all the individual parts. 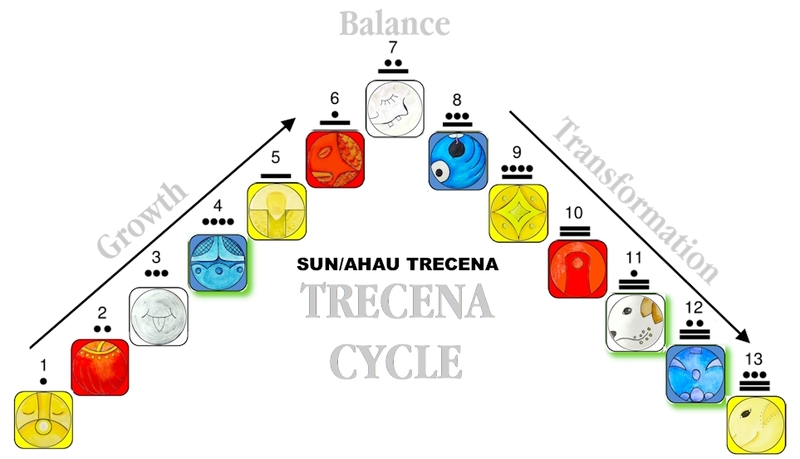 It’s worthy to reflect on the Day Signs of this trecena as the different perspectives of Sun/AHAU, the perspectives which best represent the way to accomplish each of the Tones’ Intentions. So are we the individual parts of the Creator’s All in One. Through our own Spark of Consciousness, we hold our own piece of Sun/AHAU. We can also see the Day Signs as the different perspectives we can Choose as our own model of Consciousness… our ways to shine like the Sun. Tone 2 is the Intention of Duality to discern our own way to carry out a Vigil of Light. We discern Truth through a comparison of an idea or theory to the reality of the way it really works. Creation requires Love. We have many dreams. The ones that manifest are the ones that inspire us to take action. We need Passion to follow through. Sun/AHAU offers us a Dream to create a new Era of Light on Earth through Crocodile/IMIX. IMIX is the Day Sign of Innovation, known for the many new ideas, dreams, and thoughts she shares. As the Divine Feminine aspect, IMIX embodies Compassionate Love, and the Consciousness to discern Divine Truths. IMIX expresses the Creator’s communion from the Realm of Spirit as ideas that come from out of the blue. IMIX is often a day of an inspirational download with thoughts and ideas appearing out of nowhere. The Creator’s thoughts are free-form and random on purpose. Sun/AHAU wants us to create something WE Love. As Divine Children, the Creator Knows the things we Love. So, the Inspiration may not make sense at first. Yet, the ideas will Spark our own Dream of Creation. Today, IMIX can accomplish two things. First, IMIX will inspire us to create something we Love. Second, IMIX can make evident that the Creator is speaking to us. We’ll know because the inspiration came while we were thinking of something else. The idea(s) interrupted other thoughts. Pay attention to your wild ideas. Write them down. Try to remember what you were thinking when the idea presented itself. Don’t try to figure it out what it means. Just draw your consciousness to the experience. Allow IMIX to offer ALL her ideas that, together, will draw you toward a discernment of your next Intention, your next Creation, your next Transformation of Spirit. You don’t have to know it today. It can all come together in the darkness of the night. This morning I woke to the Inspiration of Sun/AHAU (1 Sun/AHAU). Strangely, it was the awakening from a very bad dream, the fulfillment of my worst fears for humanity. I woke to the rage of powerlessness. It was one of those dreams, you are glad to find out was only a dream. I saw no way to change the troubles of the world. What could I possibly do to make it better? I remembered the Inspiration of Deer/MANIK, who vigilantly stands in observation of Peace and Beauty. Deer upholds the pillars of our world, standing in the Truth of Beauty in all directions. The world’s only solution is war. Existing in unconsciousness, the ways of the world capture our attention. Engaging in the energy only creates more darkness. The only “answer” we would be capable to discern is to defeat all our “enemies.” Our Spirit knows the answer is to Love, but how? Deer/MANIK holds the Spiritual Gift of Harmonic Resonance. By standing on our own Ground of Peace, the Love we emanate will Heal the disharmony. As “generators” of the Energy of Love all we have to do to be the Hand of God is to be Present and Conscious in our own world of beauty. Our world doesn’t have to be any bigger than as far as we can see. What lies within our field of vision can be our universe. In Truth, the world reflects so many illusions, Human only believes what it can see. We define our world as only what lies within our range of vision. What we create in our own little plot can exist in our mind as “all there is.” By standing in the Beauty of the Place we Are, the Love we emanate will send ripples through the Whole. The movement of Mother Earth creates the discernment of time. The Elders taught that changes that happen quickly in Spirit’s Element of Ether take more time to be seen in a world of physicality, where change is manifest by the movement of physical matter. The Light of a Spiritual accomplishment, can only be seen through Time. The Sun’s passage will reveal a creation of Spirit we manifest on Earth. Human naturally gravitates toward experiences that capture our attention. When our Consciousness is drawn by the lower thoughts of the world (via any media other than nature), we are drawn into the picture we see. To Rise and Shine we have to Master the Possession of our own Consciousness. To hold the Authority of our own thoughts, Deer’s Vigilant Observation is the tool we were given. Deer/MANIK taught us to train our eyes on Mother Earth. Ancient Wisdom also guides us to look to the Heavens for Signs and Wonders. The Sun is our Greatest Sign in the Sky. In our Natural World, it’s a huge ball of Light that crosses the Sky and comes around again to create the Dawn. Human’s earliest experience of the Sun may have been the warmth and light that returns after a long dark night. As well as a Sign of Eternal Light, Sun is the “Sign” to get up and make the most of the Light. Mother Earth and Father Sky are reflections of the Creator’s Consciousness. If God exists as Everything, Present in Every Time and Place, then the Divine Mind that created the Beauty is still Expressing Love in the Moment. If Earth is expressing the Creator’s Love in the Moment, then SEEING her Beauty is a Divine Exchange of Love with the Creator. If we are Conscious of this Exchange, then our eyes would naturally be drawn from other distractions. Solely focused on the Creator’s Expression of Love, we would be transformed to our Highest Consciousness by merely Consciously Seeing the Beauty of Earth. Her Beauty would be the Love that heals to transform the Whole by Compassionate Love and Understanding. I’m curious about Sun/AHAU. Could we also be transformed by merely watching the Sun crossing the sky, the way the Flowers do? If Mother Earth has so much magic, then Sun holds all of it too. The Sun sends photons through our atmosphere and particles of electromagnetic energy. Solar Flares that produce the auroras, penetrate our atmosphere and interact with the electrical charge of our body. Our pineal gland, the seat of our “third eye,” is changed by the Sun’s photons. The Sun influences the rhythm and schedule influenced by Light. Sun gives us a direct dose of Vitamin D, that maintains our sense of well-being. The Sun is a power utility of Light and Heat that’s Free to every Human. Water is naturally purified by the Sun. Sun, the Divine Masculine, shares the Will to Be and the Determination to Come to Life. The Sun reflects all the ways the Creator looks out for our well-being. One Spring I watched the raising up of a small eaglet through to its fledgling flight. The bald eagles are so powerful and stern. Though as parents in the nest they reflect their expressions of love. I still remember the day of the eaglet’s fledgling flight. I didn’t see it take off, only the empty nest. One video-cam was scanning the sky and surrounding trees to find its landing place. Another cam was focused on the nest. The other cam finally found the fledgling perched in the middle of the river on a small protruding limb. The Fledgling sat so close to the water facing into the current, it was easy to imagine its view of water rushing toward and around him. He’d been stuck up in the nest for a long time. He must have watched his Father doing this very same thing every day, fishing for dinner. By watching the Father he learned to fly and execute his own means of survival. I felt the Consciousness of that family, just by watching them for so long. Over 10 weeks I learned their personalities, could tell the parents apart, and agonized along with the Mother during the thunderstorms overnight when there was no light for the video. I saw the baby shivering under the mother, when it was too big to find cover for more than its head and shoulders. I watched it “branching” – jumping around on the big branches around the nest, jumping up to a small perch above – grabbing hold tightly while flapping it’s wings. The whole experience left me with so many beautiful memories. I could live there in that world for an hour, just floating on a river of Beauty. Now I see it as a Divine Experience of Love, a Consciousness of Beauty I was sharing with the Creator. Watching it unfold was something I invested myself in. I didn’t intend to watch from start to finish. From the time the eagle hatched, it’s 10-12 weeks before they make their first flight. The Experience Engaged Me because I Loved it. I couldn’t pull my Consciousness away from the Beauty I watched every day. Today we are discerning the Intention of our next climb of Spiritual Growth. Deer guided us to Stand in the Beauty of Mother Earth. 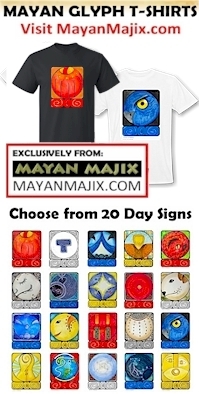 AHAU draws us into a Communion with the Sun, the Divine Source of Inspiration and Love. IMIX shares a discernment that when we are following our true Passion we manifest our own Genius. It looks that way because when we really love what we are doing, it shows up in the work. Like the Creator’s work, attention would be given to the smallest details because we would Love it enough to want it to be perfect no matter how you looked at it. Like a beautiful tapestry, the threads on the back would be just as beautiful as the ones on the front. The details in every stitch would be the expression of Love. The results would be genius. Tone 2’s Intention of Duality and Discernment wants us to consider the Beauty we will create. This is not the day for doing, but a day for Dreaming. Our Passion will be drawn to us, by drawing Consciousness to the wild ideas and Dreams of IMIX. The Divine Feminine aspect of Discernment will guide us in our unconsciousness to draw our own Dream from the Creative Void. To all my relations, the Creator will only inspire Dreams we are capable to Manifest. May we look at the Beauty in the children to imagine what the Creator must have intended as them. May we see the Earth the way we did as children. This original magic is still part of who we are, and we will Remember. May we find our own way to commit to Vigil of Light… to see what the Sun would have us see. May we break through the darkness in an Intention to draw our Consciousness to Heaven and Earth. I’m grateful that the more Conscious I become of the Creator, the more I believe that the Power of Miracles exists in everything.